Man, we didn't see this coming. YBNBY staffer Echowood's dad was in Florida and was popped for assault. Seems a gentleman at a local watering hole made a crack about Echo's dad's teeth. So he smacked the dude in the head with a beer bottle. To make matters worse, the cops were calling Echo's dad "Dracula" during the mugshot photo. Not cool, cops. Not cool. We have decided to funnel the $777 bucks we were going to raise for a dinner with Echo and myself to post bail. Until then, Echo's dad remains in county lockup bartering cigarettes for dental floss. 1. Note this happened in Florida. 2. Aren't you required to wear a shirt in bars down there? 3. If we had socialized medicine homeboy could have got dentures and Echo wouldn't have to see his daddy like this. said E on September 10, 2009 12:57 PM. said Echowood on September 10, 2009 12:58 PM. I just report the news. Don't shoot the messenger. Or hit him with a beer bottle. said Johnny Wright on September 10, 2009 1:02 PM. And once again, I wipe away a tear of joy and pride at being a Floridian. said Jeem on September 10, 2009 1:08 PM. One would think Echo's dad would get a tattoo that reads "Git R Dun" on his forehead to distract from his choppers. Talk to him about that at the next family get together, would ya? said JediJeff on September 10, 2009 1:42 PM. Hahahah... my best laugh today. "(The best part of this is Adam is sitting right next to me as I typed.)" -- Bonus points for that, J-Dub. said Leonardo Carvalho on September 10, 2009 1:59 PM. said Cindy on September 10, 2009 2:02 PM. said Johnny Wright on September 10, 2009 2:40 PM. Show this to your kids when you are teaching them to floss. said E on September 10, 2009 2:44 PM. Damn, the Cavity Creeps won! said Baierman on September 10, 2009 2:58 PM. How do you know the Toothbrush was invented in Florida? Otherwise it'd be called a Teethbrush. said E on September 10, 2009 3:01 PM. Correct me if I am wrong, And I may very well be, But shouldn't the teeth be INSIDE the mouth? Im no dental expert, But I'm pretty sure there are meant to be lips in front of those things. said Frank the Tank on September 10, 2009 4:38 PM. When you only have 3 teeth left, you want to show 'em off every chance ya get Frank. said phatlard on September 10, 2009 5:16 PM. And among all his friends, he is the inly one who can show TEETH intead of TOOTH. said Leonardo Carvalho on September 10, 2009 6:36 PM. 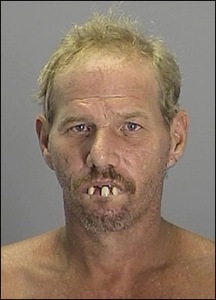 This could not be from Florida, he's got two too many teeth for these parts. said Pace on September 12, 2009 2:00 AM.